A design exercise team was assembled under the direction of W.J. ("Jackie") Jakimiuk for a primary trainer in both Canada and the United Kingdom. The team began production in Decem-ber 1945 of detailed parts of what was to become known as the Chipmunk, culminating in the first flight on 22 May 1946 at Downsview, Toronto. The prototype, flown by Pat Fillingham from the parent company at Hatfield, was powered by a 108kW de Havilland Gipsy Major 1C. Chipmunks built to the prototype's specification were designated DHC-1B-1, while those with a Gipsy Major 10-3 were designated DHC-1 B-2. Seating is tandem fashion under a sliding bubble canopy. A 145 hp Gipsy Major four-cylinder engine turns either a fixed-pitch wood propeller or a metal Fairey-Reed airscrew. The fuselage and wings are of allmetal construction, but the ailerons, elevators, and rudder are fabric covered. 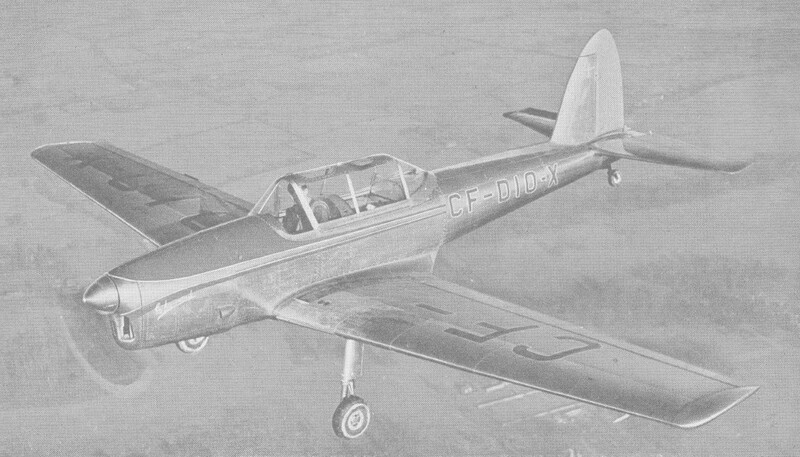 Downsview built 218 Chipmunks, the last in 1951. The first batch being built in Canada, a total of 153 aircraft. Examples from this initial production run were sent as demonstrators to the UK, South Africa, South American and India, as well as the RCAF which accepted 45. These original aircraft went to the 14 flying clubs in Canada which participated in the ab initio air force training and refresher flying scheme. 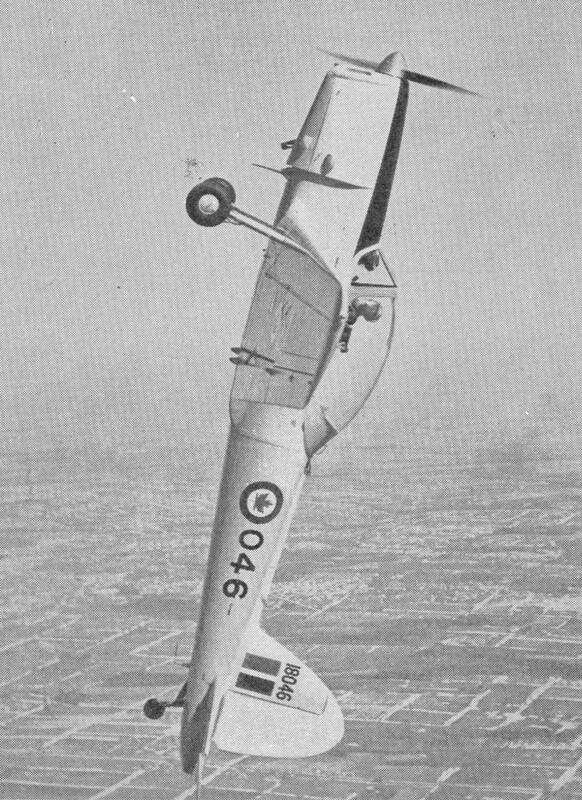 In 1955 a further order of 60 aircraft was placed by the RCAF. 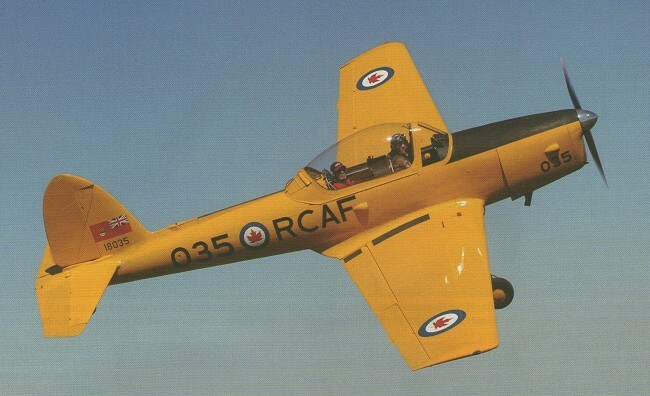 In all, the Canadian production totalled 218, the majority of this number sporting the distinctive one-piece bubble canopy and designated the Chipmunk T.30. The main external difference between the British and Canadian aircraft lay in the design of the canopy, the British version having the metal formed pattern. The RCAF accepted its first DHC-1 Chipmunks in 1948 and did not retire the last one until 1972. Two were evaluated by the Aeroplane and Armament Experimental Establishment at Boscombe Down. As a result, the fully-aerobatic Chipmunk was ordered from Hatfield and Chester to Specification 8/48 as an ab initio trainer for the RAF. The value of the Chipmunk had also been realised by the RAF, which placed large orders, eventually taking on charge 740 examples of a total production run of 1000 aircraft manufactured in Britain. Beginning in 1950, the University Air Squadrons were the first RAF units to receive Chipmunks, shortly followed by the twenty Reserve Flying Schools. The first to wear RAF roundels were flown by the Oxford University Air Squadron from February 1950; thereafter, the type replaced the Tiger Moth with all 17 university air squadrons. National service pilots underwent their initial training on the Chipmunk, which served intermittently at the RAF College, Cranwell. The selection of the Chipmunk as the RAF's primary trainer during the early 1950s expansion of its pilot training programme transformed the aircraft's story. With increased orders to meet these expanded needs, eventually totalling 735 out of 1,014 manufactured in the UK. In 1952, the aircraft received the royal seal of approval when HRH the Duke of Edinburgh took his first flying lessons in Chipmunk (which can be seen at RAF Museum Cosford) operated by a special flight at White Waltham, Berkshire. New trainers such as the Scottish Aviation Bulldog entered service with the RAF but they did not completely replace the Chipmunk. Many Air Experience Flights continued to operate Chipmunks through the 1980s and into the mid-1990s. Although best known as a training aircraft, RAF Chipmunks operating from Berlin were converted for covert reconnaissance missions. A few Chipmunks of No. 114 Squadron were pressed into service in Cyprus on internal security flights during the troubles of 1958. Chipmunk production was also under-taken by the Portuguese, who purchased an initial batch of 10 UK-built aircraft and produced a further 60, built under licence by the state-run General Aeronautical Material Workshops (OGMA) aircraft factory. Manufactured from 1955, the Portuguese air force Chipmunks were due for retirement in 1989, but many examples are still in service with the RAF, Sri Lankan air force and the Royal Thai Air Force. Other users included Burma, Ceylon, Chile, Colombia, Denmark, Egypt, Eire, Iraq, Jordan, Lebanon, Malaya, Saudi Arabia, Syria, Thailand and Uruguay. On 27 March 1997, the Army Air Corps flew their last sortie in the Chipmunk T.10. As a civilian replacement trainer, how-ever, the Chipmunk was never really a great success, due almost entirely to the cost. In 1948 a new Chipmunk cost $C10,500 which, compared with a war surplus Tiger Moth at $NZ500. Only six DHC-1Mk.21s were made in the UK specifically for civilian use, com-ing off de Havilland's production line at Chester in 1952. The six were built as Mk.20s - the export version of the Chip-munk - but were converted to yet another model, the Mk.21. Differences included the replacement of the military cartridge starter with an electric unit and the fitting of two 12 gal fuel tanks in place of the 9 gal tanks of the RAF Chipmunks. A total of 1277 Chipmunks were built in either Canada, the UK or Portugal. Wing span: 34 ft 3 in (10.5m).